With users purchasing bigger displays and affordable 4K HDR10 & Dolby Vision, Kodi capable Hardware now on the market it's time for an appropriate thread. Quote: Dolby Vision is a proprietary format and Dolby SVP of Business Giles Baker has stated that the royalty cost for Dolby Vision is less than $3 per TV (click). 4K capable media player hardware must also be able to Hardware decode 10bit HEVC (H.265). This requirement excludes NVIDIA's GeForce GT1030, GT1050 cards when running on Linux / LibreELEC. See THIS thread (click) for details. Quote: ....designed to match the media player's output frame rate to the original frame rate of (video) content. This applies to content that's mastered at different frame rates, for example 24fps film-based content or other international video content encoded at 60, 50, 30, 25, and 24fps. Media player output frame rates will also match (and switch) the display's refresh rate appropriate for your region. For example 29.97fps for NTSC. 25fps and 30fps content uses frame rate doubling to display at 50Hz and 60Hz when available, matching its original appearance while preserving a fluid user interface. Nice smooth video playback of virtually all video content (including Apple TV 4K Apps), and also to auto switch a display into it's 24p Cinema or Movie Mode. - Kodi running on HDR capable Windows hardware. Quote: To match (the media player's) colorspace output to the original dynamic range of (video) content that you’re watching. You want a media player to autoswitch, without user intervention - colorspaces between SDR / HDR10 / DolbyVision depending on the dynamic range of video content and a displays actual dynamic range capabilities. - Possibly Kodi (or forks therof) running on HDR capable Windows. - Why is the NVIDIA Shield not listed ? 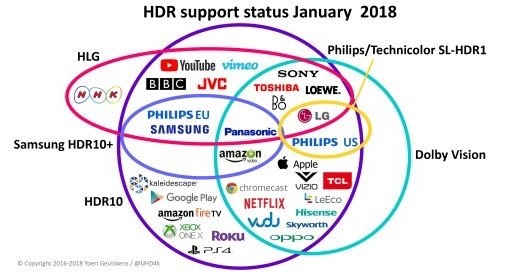 Auto frame rate switching & dynamic range matching must work though to make the list, with no user intervention needed to fiddle with device settings all the time when watching mixed SDR / HDR10 video content. You want set once and then forget. Hello, I installed this version http://mirrors.kodi.tv/test-builds/darwi...b-tvos.deb and the auto frame rate doesn't work for me. I put on a 24fps movie and it still has 50fps as the interface, is there any other version that works? I read in a post that someone had made some changes in the code and that it was necessary to compile, but I don't go out to compile, and I look for a. deb in which the Frame rate works. One needs consider type of HDR display as well, and HDMI cables (whether they can pass HDR reliably, and length). AVR in between is another factor. Need all 3 to play nice with the media box in question. Re: display, for example, Epson 4000 & 5040UB PJs are limited by 10.2Gbps HDMI bandwidth so no HDR at 60fps. These PJ’s are also fussy with HDR at 24fps. Shield TV and Zidoo X9S work, but Roku no. Apple 4K unreliably. Re: AVR, for example, my Yamaha 3050 must be put into “Mode 1” via an advanced menu. Even so, it behaves a bit wonky sometimes, with media box and display behavior on opposite ends not aligning. (2017-12-05, 20:34)hdmkv Wrote: One needs consider type of HDR display as well, and HDMI cables (whether they can pass HDR reliably, and length). AVR in between is another factor. Need all 3 to play nice with the media box in question. Isn't this now handled by a lot of devices as 'Enhanced' HDMI modes. Both my Denon AVR and my Sony UHD HDR TV have 'Enhanced' HDMI options - which AIUI enable or disable the higher bandwidth HDMI 2.0a modes (that are needed for 2160/60p 4:2:2 and higher bit depths?). AIUI you can do 2160/24p 4:2:2 HDR over a low bandwidth connection, as well as 2160/60p 4:2:0 SDR. Not sure; certainly would be nice to accomplish managing HDMI bandwidth w/o needing to buy & introduce into the chain a device like HDFury Linker which many Epson PJ owners have. @wrxtasy, does U9-H manage "Auto frame rate switching & dynamic range matching" under Android, or only LE? I do not have a HDR TV to test but I've not seen a single complaint about really bad colorspace outputs with Android on the U9 once devices are initially setup and people are viewing mixed SDR / HDR10 content. MINIX since U9 release have done a LOT of tweaking to the U9's - Android Firmware. I certainly get decent picture outputs using Android Kodi Krypton for 4K HDR10 video content viewed on a 10bit SDR 4K display so AMLogic's HDR10 > SDR matching is definitely working, same as it does with AML LibreELEC Kodi Krypton. Auto Frame rate matching also works for Android Kodi and I believe Plex. Android TV - Live Channels App also. You can then see exactly what HDMI EDID negotiated display and colorspace modes the S912 is reading from the Epson PJ. These can then be tweaked and put in a disp_cap file in the .kodi/userdata folder when using LE. I already returned that S912 box to Amazon, but may just order a Minix U9 to try HDR w/Epson PJ via Android & LE. Why the heck not?! Zidoo just released a beta firmware two days ago allowing auto framerate and resolution switching. Will try tonight! Update 1: Just tested and it's working really well! Cancelled my Minix U9-H order; don't need it now . Tried HDR 23.976/24/59.94/60 clips along with 720p/1080p 23.976/24/30/59.94/60 clips, and auto framerate + auto refresh rate switching work beautifully. It takes about 8 seconds for the image + audio to resynch. With my Epson PJ unable to render 4K 10bit @ 60Hz, Zidoo auto-switches to 8bit. Update 2: Finding some bugs... 50fps gets forced to 25, and 720p/1080p MKV's get stretched vertically (like 1920 x 800 MKV's displayed at 1.78:1). So, Zidoo has some things to iron out here. Yes more feedback like that pls. I will wait for further testing and stable Zidoo FW before it gets added to the list. Also HDR10 > SDR conversion must be automatic to make the list above. I actually bought an Apple TV 4K for Xmas after Apple finally added my wishlist of user adjustable video playback features. My last (very hacked one) was a 2007 Apple TV 1. The ATV 4K has Auto frame rate switching & dynamic range matching - working perfectly, even for tvOS Apps like Netflix with 24p. Helps when my 4K TV refresh switches in 1/2 a second. Apple are using a high quality upscaler as well. Picture output quality is quite superb. Surprisingly normally troublesome VC-1 video plays back without issues too. And the BIG one for me, MrMC (Kodi Jarvis Fork) has perfect mpeg2 & h264 1080i high quality full motion deinterlacing (YADIF2x) for watching OTA TV from my TvHeadend server. Yeah the ATV4K is my go-to box now. I'm tempted to get a dev account to throw Kodi on it when it gets support for the dynamic range/refresh rate switching. I re-tried ATV 4K & got it to play nice w/my Epson 5040UB. Had to try a different HDMI cable. Odd why some "High Speed" HDMI cables work & others don't. Or, it could've been official tvOS 11.2 vs the beta I'd been testing with earlier. With ATV 4K, if Apple adds ATMOS & DTS:X as they told theverge.com they would (apparently on their roadmap), it would be a pretty compelling enthusiast box. Yes I had to use another HDMI cable as well with the ATV 4K and hard select the Chroma to 4:2:0 otherwise I was getting Mini black screens when watching 4K Netflix. I really should get a proper "Premium Certified" 18Gbps - tested HDMI cable. (2017-12-12, 04:03)hdmkv Wrote: I re-tried ATV 4K & got it to play nice w/my Epson 5040UB. Had to try a different HDMI cable. Odd why some "High Speed" HDMI cables work & others don't. Or, it could've been official tvOS 11.2 vs the beta I'd been testing with earlier. Apple's only said Atmos is on the roadmap, not DTS:X. It's also most likely going to be Atmos embedded with EAC3, not TrueHD. It's the downside of the ATV4K, no Atmos/DTS:X support with lossless tracks (but I can't really tell the difference between the DTS:X track vs the same track passed as Neural:X and PCM and the same with Atmos/Dolby Surround).